I am an extremist by nature, or at least I used to be. It’s possible that age and experience have tempered that. So, it’s strange when I find myself in gray areas or in areas of freedom for myself and extending it to others. And even more so when I get mad that an extremist kind of mentality is being promoted. Fostering parenting is one of those areas. 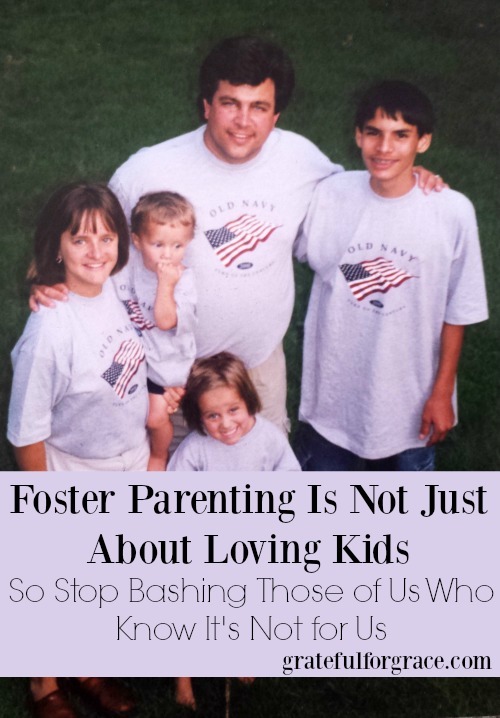 There is a very real need for foster parents. Thousands of kids in a precarious system, need love and safety fostered in their lives. And lately, there has been a lot of links shared in my feed on Facebook about how the best kind of foster mother is the ones whose heart breaks when the foster child leaves. These links encourage women and men to go for it because it’s ok to have your heart broken for the sake of a child. And I agree. And I disagree. I agree in the sense that I wish more people would consider fostering. I do believe that some people, many people possibly, haven’t fully considered it and won’t. We need them to. And many of those mothers can handle the loss well. But I also disagree because there are some of us who have already walked that path and hated it. And don’t want to do it again. And there seems to be little grace for that. That somehow because I don’t want to repeatedly risk losing a child or children, that I am selfish and unloving. Honestly, I think we need to know ourselves well before fostering or adopting. And I have learned a lot about myself in the last twenty years or so. Oh, for sure, I have been wrong about myself before. For example: I didn’t want an open adoption. I thought it would be too hard to navigate and I was scared to death of losing the child to the birth mother. God, in His infinite wisdom (and possibly sense of humor), saw fit to bring me the most open kind of adoption there is, really. He also knows me well enough and I have grown wiser in my life, so that He had to make it crystal clear that it was His plan for me. For the baby. For the birthmom. For my family. Or I wouldn’t have done it. I have walked the path of fostering. And it was incredibly hard. And that experience is mostly why we didn’t approach foster to adopt when looking into adoption. I briefly looked into it, but when a case worker in New Mexico told me it could be three years before finalization and it wasn’t even guaranteed, I knew it wasn’t the route for me/us. I am not wired to be the kind of mama to let go well, especially after that long. To let a baby go back to someone else. Granted, Daniel was twelve when he came to us and older child fostering is a different game than fostering babies, toddlers, or young children. I know that. Still, I don’t want to love and give up to a system and love and give up and love and give up. Or even just once do that. I saw how subjective the system is. How hard it can be to work it. How children get damaged and sent back to horrible situations. And I don’t trust the system. And I am not up to fighting it. And you know what…. that’s ok.
I’m sick of me and mothers like me being cast in a light that is so negative. Simply because I know myself well enough and I have had experience with the system and I put those together and believe that foster care is not for me at this point in my life. Or in my children’s lives. Could that change? Of course. And I am willing to hear God’s leading on that, if He changes my heart and mind and situation. But, friends, please please stop encouraging a mindset that any loving parent can and should foster parent. That loving and losing to a sucky system or to another parent or even to a sucky parent or family member is ok for everyone. And I am one of those nots. Deciding to foster parent or adopt from the foster system is an incredibly complicate decision. Acting like or promoting the idea that it is simply about loving a child is unfair and unwise. There are many factors to consider before taking that step. Just as you don’t just choose a house you love, or marry someone without thinking it through well, huge decisions come with huge issues. It makes me think of a movie where the female lead says, “After all, I’m just a woman standing here asking a boy to love her.” Sure, there are all the feels, but it’s not about just that. No, no. It’s not that simple. So much has to go into that moment and lots of questions to answer. Do I mean that the knee jerk reaction should be no? Of course not. But I also don’t think it should be yes. Praying and thinking about all the aspects and making sure your no is for a God honoring, wise reason or forty, instead of a selfish or silly reason or forty is prudent. Your reasons do matter, for sure. This can avoid children being mistreated, families suffering greatly, disruptions in adoption, or mothers falling apart in big ways. Fostering parenting is beautiful, but it isn’t just about loving. Extend grace to others and pray for those who haven’t considered foster parenting to consider it and follow the Lord’s leading and for those who have answered the leading to be strengthened and equipped. Because it’s usually a hard road. Do you think all mothers who love well can be foster mothers? You may want to read my posts: Sometimes Love Isn’t Enough for Kids.